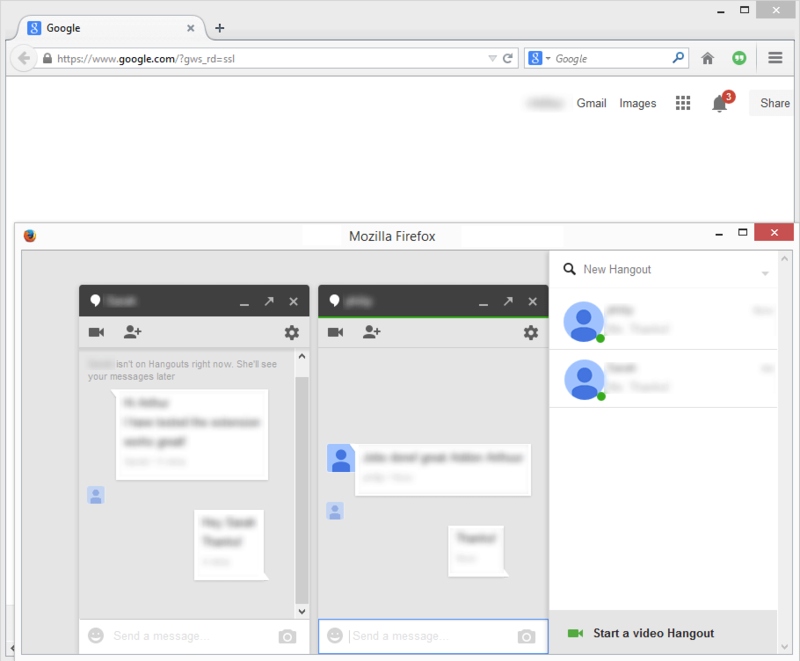 "Messenger for Google™ Hangouts" is a Firefox and Opera extension that provides an easier method to access Google Hangouts inside a panel. Normally to access Google Hangouts you need to open it inside a tab, using this extension, you can easily access this service without the need to switch tabs which may distract you from your work. Note that the sole purpose of this extension is to provide a better experience to users of Hangouts and it is NOT THE INTENTION to mislead anyone to think this is the official Hangouts extension. How can I use this extension? After installation, you will get a toolbar button which allows you to open the panel view. Once panel is loaded you get access to the official Hangouts. For usage please read Get started with Hangouts documentation. Basically, the extension loads the offical Google Hangouts webpage in a distraction free environment by removing all unnecessary blocks. You can consider it as a chat-alone window similar to the old Google Talk chat client. Please note that this extension only loads the offical Hangouts inside a panel view. The content of the panel is provided by Google Hangouts. For terms and conditions please visit https://support.google.com/hangouts/?hl=en#topic=6386410. To add/remove the toolbar icon right-click on a free space in your Firefox toolbar and select "Customize...". Now you can drag and drop the button to a new position. For more information on how to customize your Firefox interface please visit a Comprehensive Guide to Firefox Customization.